I basted my Patriotic Jacket together earlier this week. What did I find??? 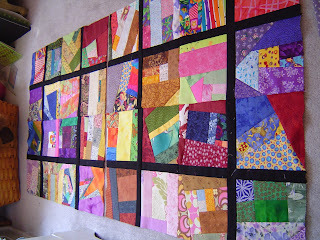 1st 100 - Patch Block, a photo by basketcasejoy on Flickr. So, the question remains, why is this called a 100-Patch Quilt? There are 100 cut squares in each quilt block. You then add a narrow sashing strip and a row of 44 patches around each of the blocks. Once that's done you add wider sashing strips and a border to assemble the quilt top. I could either use the stack of 1" squares or I could be reasonable and choose the stack of 1.5" squares. The voice of reason won out and I am using 1.5" squares for this jewel of a quilt. 1.5" squares from my 1" drawer, 1.5" squares that I am cutting from my scrap stash, and 1.5" squares that I am cutting from "gift" scraps. I absolutely LOVE "gift" scraps!!! SAFF 2011 Haul, a photo by basketcasejoy on Flickr. The Southeastern Animal Fiber Fair was held October 21 - 23, 2011 at the Western NC Agricultural Center in Fanning, NC. That's right outside of Asheville, in case you didn't know. I went with the Mebane Knit Guild and had a great time. I meant to blog about it sooner, but never seemed to get around to it. Sorry! Here's what happened... I went a little crazy in the vendor booths! This is the picture proof. Flames in Action, a photo by basketcasejoy on Flickr. I shared this portion of a quilt on Ravelry earlier today. Someone had suggested that one of the quilters might want to use a fire themed quilting design on her hot-colored Blooming 9-Patch quilt. I had used such a design and decided to share. The quilt is named The Happy Accident because my friend and I did some bad math when figuring out how many blocks to make for quilts for my two sons. There were enough leftover blocks to combine with "plain" squares for another quilt. The resulting quilt was a lap quilt for my husband. I used "fire quilting" by Vikki Pignatelli for my DH's quilt because flames (for fast cars) were a recurring theme in the fabrics that were chosen. I made the quilt a number years ago. It hung in the 2006 NC State Fair and brought home an Honorable Mention ribbon. It's been quite a while since my last post. I didn't realize just how long it's been! Oh, well, I'm back now. I was busy quilting on 11/11/11 (and the days before and since.) I've used early morning hours and spare chunks of time in the evenings to put in some work on my Leader/Ender project, the 100-Patch quilt. I've also made some serious headway on my Crumb quilt. I'm really hoping to finish it by the end of the year. There's only ONE seam remaining before it becomes a quilt top!!! Hopefully, I'll have photos to share soon. MR4 Winter Goodies, a photo by basketcasejoy on Flickr. I was SO excited to get my MR4 Fall swap that I didn't realize that my MR4 Winter swap had arrived on the SAME day! Can you imagine my surprise??? I felt like I had won the lottery!!! Just LOOK at all of the cool stuff Fidissimus included in my package. The BEST part was that she used the SAME mailing envelope that I had mailed to her! I love the fact that she reused it. So. Did you SEE all of the cool stuff that was included in the package with my adorable snowman mug rug? Fabric, yarn, a selection of tea, a Knit Happens bumper sticker, AND the MOST AMAZING tape measure ever!!! I heard that it snowed today in a number of states. I think that we should celebrate... that we DID NOT get any here!!! MR4 Fall (Reverse), a photo by basketcasejoy on Flickr. MR4 Fall Goodies, a photo by basketcasejoy on Flickr. Look at the cool mug rug that Nyesara sent from Australia. It's reversible! She also included a beautiful fat quarter, a zentangle coaster, and 2 adorable patterns from an Australian designer. Progress Goes to the Dog(s), a photo by basketcasejoy on Flickr. I thought about working on "Blackie" this week, but chose another project instead. However, you might notice from the photo that I have made significant progress since the last posting. There's still a LONG way to go! The "wall" fabric has been chosen and a bit of fill in needs to be done. Then all that remains is the stitching. I'm hopeful that it will turn out well. I am hosting another Mug Rug Swap on Ravelry.com and this time we voted to have a common theme. Well, common THEMES, to be more precise. The chosen theme for MR4 will be Fall or Winter, the season or holidays within, recipient's choice. What FUN!!! Although, I thought that I might have to drop out, since we were one swapper short. I put out a call for a Swap Angel, but there wasn't one available. However, in the end, I just signed myself up for two. I had a mug rug almost ready to go that fit a fall theme. Another wouldn't really be a problem. Don’t know why I didn’t think of that to begin with! My swap partner wanted a "Modern" Winter themed mug rug with icy blues/creams and pop of red. I think that I've got it covered. I'm sewing down the binding this afternoon. Once that's done, only the embellishment remains. Once I realized that I could actually manage TWO mug rugs, I went to work on finishing one that I had put together over the summer (when I was studiously ignoring several of my UFOs.) My 2nd swap partner had chosen Fall - the season. This was lucky for me. That piece that I already had in the works could work perfectly for this theme. I absolutely LOVE it when I can combine a new project with a bit of a UFO!!! By now, my list is probably starting to look VERY familiar to you! It hasn't changed much over the months. I'm hoping to make more progress during this session. 9. MR4 Fall - COMPLETED photo to be posted after it's received. There are deadlines looming on the last two UFOs. Obviously, they WILL get done. Beyond that, who knows??? However, I am hoping for the best. Hooray!!! for the largest UFO Club to date. Our 18 participants worked hard to complete the most projects yet. Alas, we were TWO projects short of breaking the Club's Most Completed Projects record for a session. Better luck next time! Session Totals: 15 members completed a total of 27 projects. Congrats! to Jmoorecrafts and Rollacameron for each finishing THREE projects during the Summer 2011 UFO Club. Thanks to you and our other 13 finishers for nearly breaking a Club record for completed projects in a single session. And to our members who were unable to complete a project during this session, we hope that you will come back to try again another time. We had another outstanding session of The (Ravelry) UFO Club. Thanks to YOU for cheering us along! The MR3 made by Me, a photo by basketcasejoy on Flickr. I just realized that you never got to see the MR3 made by me. Oops! Sorry about that. But, what was YOUR challenge?! Oh, you want to hear about that, too? Well, my recipient specified her color preference would have to be bright warm colors (reds, yellows, pinks, oranges.) She stated that any theme would be fine. However, her challenge was that her mug rug would have to incorporate a block of some kind i.e., star, log cabin…whatever my preference. She loves all blocks! Would you like to hear about the process? HOW am I going to quilt this thing??? The answer to that question revealed itself as I was sitting on my bed. Of course! I've admired the quilting on my bed quilt for many years, but have never attempted replicating it... until now. I wanted to post immediately after my mug rug was completed, but I didn't want it to be posted before my swap partner received it in the mail. Unfortunately, time went by and I didn't hear from my swap partner. I really hope that Dragonknits is enjoying the MR3 that I made for her! This little mug rug sort of morphed from its Log Cabin beginnings and became an off-center, log cabin leftover repository with uncharted free-motion quilting designs. It was fun to make and the colors were perfect for the recipient! 1. That I was able to think of a creative solution to a piecing problem. 2. That the free-cut letters turned out well. Quilting 106, a photo by basketcasejoy on Flickr. That's EXACTLY what I did!!! It sounded SO interesting that I borrowed a photo of a neighbor's beloved pet. He is the sweetest dog that I've ever met and there's the most adorable pet photo I've seen, hanging on the wall of my neighbor's home. I just HAD to give this class a try. You can see the photograph at the top of my picture. Beneath that, you can see the progress that I've made so far. If you look on the right side of the photo, you'll get a better idea of the process. It's sort of like paint-by-numbers for quilters! The teacher, Aniko Feher of Detroit, Michigan, was very encouraging and quite helpful in making her students' photos come to life in fabric. I'll post further progress, as it occurs. "Big Block" #7, a photo by basketcasejoy on Flickr. UFO Day today! I began with a stack of "2-patch" sections and added sashing to make 3 "4-patch" blocks. Once those were completed, I was able to sew them togther (with 1 more that I had finished another day.) I'm happy to have added "Big Block" #7 to my slowly growing stack of components for my Crumb Quilt. Inside of Patriotic, a photo by basketcasejoy on Flickr. of my Patriotic Jacket, you will find this fun fabric. The quilting that you see is a portion of the work that I completed at my quilt retreat. Hard to believe that was TWO WEEKS ago!!! I'm sad to say that I haven't gotten a whole lot of quilting done since then. MR3 Challenge (in use), a photo by basketcasejoy on Flickr. Please note the computer had to sit a bit skewed so that you could get a good view of the mug rug. MR3 Challenge, a photo by basketcasejoy on Flickr. Hooray! My MR3 Challenge has arrived in the mail!!! The colors are perfect and the design blends right in with its surroundings. Here is the full view of the MR3 Challenge mug rug that I received from RainMommy. My challenge concerned the size of the finished piece. She more than met the challenge! The mug rug was meant to be a "place mat" of sorts for my net book. Why? We have glass top tables and my computer has missing "feet!" I didn't want to scratch the table. I love Ravelry and all of my quilting friends there! Now, who's ready for MR4??? Art Bee Challenge Fabric (Close-up), a photo by basketcasejoy on Flickr. "Quilt" Quilt, a photo by basketcasejoy on Flickr. This 9" x 12" quilt began as part of my Journal Quilt series. Quilting friends were experimenting with stencils and painting with crayons. Have YOU used this technique??? It takes a LOT of paper bags to iron out the wax! The end result is vibrant and fun. However, the project sat (unfinished) for many months. My Art Bee's issue of a challenge brought this little quilt back to the forefront. I wanted to participate in the challenge, but I didn't want to start a NEW quilt! Hmm... what's a quilter to do??? Well, if you were me, you'd look around your studio for a UFO that would work with the "challenge fabric." (That's the inner border and the binding.) This little quilt fit the bill! The colors are perfect and the busy little print is just "playful" enough to work for the border and binding. Quilting with a friend today. I absolutely LOVE days like this! Not only did I get some QUILTING done, but I actually FINISHED something!!! WOW! It feels GOOD to be able to make that announcement. No photo to post at the moment, but I'll be sure to add one as soon as my swap partner receives her quilt. It's Starting to Look a Lot Like a Jacket! It's Starting to Look a Lot Like a Jacket!, a photo by basketcasejoy on Flickr. This is the front panel of the jacket. It may look a bit strange in its unfinished state, however, there's still a slit to be cut down the center once the quilting is done. The binding fabric will add a little spark and I've got some plans for some embellishment,as well. PLUS... this is still in the "rough cut" stage. It will all come together in the end. Progress... On the Flip Side, a photo by basketcasejoy on Flickr. Here's a shot of my Patriotic Improv Jacket when I finished sewing last night. I'd LOVE to say that it's ALL done tonight, but it's NOT! Well, as you can see, there are a LOT of pieces to put together! Additional Patriotic Progress, a photo by basketcasejoy on Flickr. The Mini-Retreat continued yesterday and this is what I accomplished. I'm VERY excited! Patriotic Progress, a photo by basketcasejoy on Flickr. I am SO excited! I've made some additional progress on a UFO. My Patriotic Improv Jacket is coming along nicely. It’s a jacket of my own design and since it's July, I decided it was time to (FINALLY!) get moving on it. I went to the Mini-Retreat with a bag of fabric strips and leftover blocks. With help from Knittingsuek, who came up for the Mini Retreat (and a few other friends)… placement of the majority of the blocks has been determined. I might just come away with something that more closely resembles a quilted garment! Hello from NeedleB's quilting mini -retreat! Yesterday, I spent all day with quilt-y friends and I'm headed back for more quilting FUN! What's that? Oh! What have I gotten done??? The sweatshirt for my Patriotic Jacket UFO has been de-constructed. The rows/columns of my Purple and Green Coin Quilt have been sewn together. My inner border was attached shortly before midnight. The outer borders remain. Check back later for further progress. Photos of quilts 7 - 17 can also be found in various posts here on my blog. Unfortunately, there are a number of different posts. Too many to link. Sorry! Just have a look around and you'll spot them. Watch for updates because I'm hoping to finish a number of these. Wish me luck! What an amazing group of quilters we had for this session of the UFO Club! There were 16 participants and we had the most completed projects, yet. Congrats! 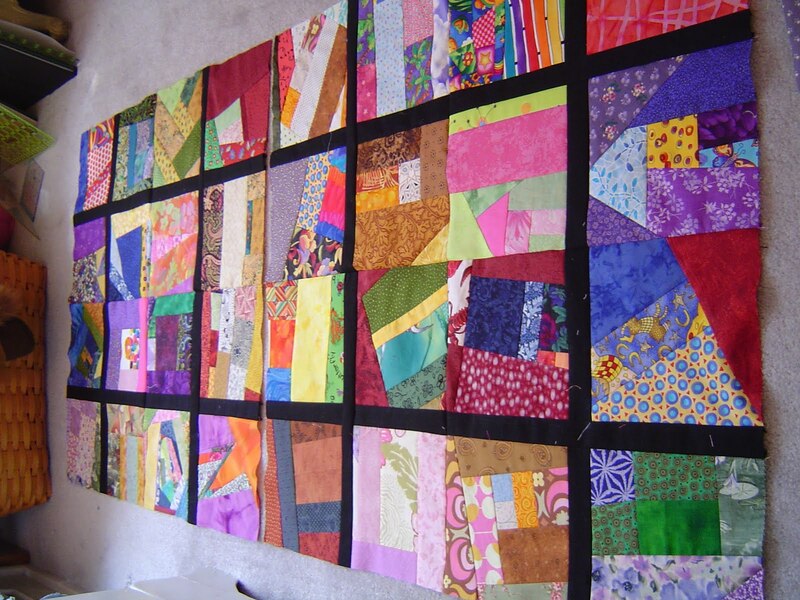 to the members who completed one or more quilts and thank you to ALL members for your inspiration and encouragement. Session Totals: 12 members completed 28 quilts!!! Thanks for a GREAT session, everyone. Special thanks to Fishandstitch (6) and Thepoch (7) for bringing this session's totals over the top. Congrats! on your UFO success. I hope that the members who weren't able to finish a project during this session were inspired by you and pleased with the progress that they were able to make. Come back for more UFO fun next time! Can you believe that it's my one year Blog-a-versary??? Hooray!!! Thanks for making it a GREAT first year of blogging fun. 2011 Dye Challenge, a photo by basketcasejoy on Flickr. You might recall that I attended a Dye Workshop last month. Well, I accepted this year's Challenge issued by our project leader to create a quilted item using some of our hand-dyed fabrics. I chose a special fabric to make something with before this month's meeting (which was this morning.) Why was the fabric that I chose particularly appropriate? The project leader had given it to me at the Dye Frenzy! I added stars & waves quilting to a piece of fabric that I double dipped. It was a technique that I hadn't tried before. Unfortunately, this piece was in one of the later dye baths and the colors are more muted than I would have liked. Maybe next year... For now, it seems perfectly happy hanging in my kitchen for the summer! 3 More "Big" Blocks, a photo by basketcasejoy on Flickr. Of course, I'm NOT saying that's all that I have left to make! That's just the number of "Big" Blocks that I finished up today. They are constructed in giant 4-Patch blocks. Each of those are composed of 4 individual Crumb blocks with black sashing in between. "Your Blogger credentials are invalid. Perhaps try removing and re-connecting this Blogger account." when trying to post from the photo and another when trying to click the "Insert Image" icon. It's been EXTREMELY frustrating, to say the least! I found these Converse sneakers while searching for "Cowboy" attire for DS2. His Middle School band went country for the final concert of the year. Could YOU have passed them up? They are SO cute! At a cost of only $4, I couldn't leave them. PLUS... They were just my size! It appears that the Raveller's method worked. Thanks, GirlReaction! Now back to your (not so) regularly scheduled quilting posts. And now, I'm moving toward visions of a completed quilt top. This last photo represents 2 of the 3 "big" blocks that I have completed. In retrospect, I probably should have just made BIGGER blocks! Oh, well... Off to stitch up some more "big" blocks!!! My local quilt bee had SO much fun at last year's workshop that we decided to make it an annual event. Some of you have been waiting to see the results of this year's Dye Frenzy that was held on May 21st. After two weeks, this photo shows a collage of my efforts. Think! (Completed), a photo by basketcasejoy on Flickr. First off, I'd like to say THANK YOU to everyone who has served in the military (or had a loved one who has served.) THINK! could just as easily have been created to remind you to remember those who have survived, been wounded, or have lost their lives serving their country. That's what Memorial Day is all about! Next, I'd like to apologize to my readers. Somehow, I have neglected sharing a project that is almost a month old! Teacher Appreciation Week is a BIG thing at DS1's school. Each year the PTSO collects items or monetary donations for gift baskets that teachers have a chance to win. This year, I decided to ask if they would like for me to make a quilted gift to be included in a basket. Being on a mug rug kick lately, that was my choice for the quilted item. I found a fabric (in my scrap bin) that wasn't too "girl-y" and went from there. Choose a design that would be appropriate for a teacher's desk. I did the letters with free-form piecing using a method that I learned in a workshop with Bonnie Hunter of www.quiltville.com. 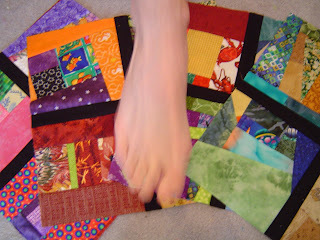 She learned the method from her friend Tonya Ricucci, The UnRuly Quilter of http://www.lazygalquilting.blogspot.com/. I'm pretty sure that Bonnie is no longer teaching these letters as part of her class because the method can now be found in Tonya's new book titled Word Play Quilts. "Quilt" quilt (layered), a photo by basketcasejoy on Flickr. I've had this small art quilt project on the sewing table (untouched) for nearly a year. Yesterday, I applied the borders and layered the quilt! I had a stoke of brilliance while looking at the quilt top. Wanna hear about it??? More information will follow upon completion of the quilt. Today was the 2011 Dye Frenzy for my local quilt bee. Just like last year, it was back-breaking work! Just like last year, a great time was had by all! I published a list of all of the "leftover" colors that were available and new colors were purchased to fill in. This year I focused on using the six "new" colors. I'm fairly happy with the results and will be happy to add these new creations to my personal hand-dyed collection. Next year, I'd like to focus on doing more elaborate dyeing techniques. One of my friends was extremely successful in dipping her fabric into multiple dye baths. Another experienced good results using more traditional "tie-dye" techniques. AND...start thinking about the challenge that was issued by the workshop leader! Hmm... what to make??? Hopefully, I'll be able to post pictures soon! The King Sized Wall Hanging - Completed!!! The King Sized Wall Hanging, a photo by basketcasejoy on Flickr. After a day of quilting, I am happy to report that I have just completed another project for the Spring 2011 (Ravelry) UFO Club. I sewed down the sleeve, finished the binding and added more quilting to my 30" x 30" square quiltThe King Sized Wall Hanging. Although, I'm sure the judges would say, "Could benefit from additional quilting." TOO bad!!! It's finished and I'm happy with it (for now.) I can always add more quilting later. It's not likely, but I **could** if I decided that I would be happier with additional quilting. This quilt began it's life more than five years ago as the leftovers from the leftovers of a King Sized quilt that I made for a friend. I have now completed FIVE quilts (of various sizes) from the fabrics purchased for that ONE quilt. And there are STILL more scraps remaining! Hmm... I wonder what I'll make next??? My 1st Finish of the Spring 2011 UFO Club!!! Quilting 077, a photo by basketcasejoy on Flickr. My "New" Batik Jacket is FINALLY finished!!! This began as a stack of fabric (as quilt projects often do) and a de-constructed sweatshirt...more than THREE YEARS AGO!!! I started it to replace the jacket that I gave a friend when we moved away. It was a bit big for me, but it fit her perfectly and she LOVED it, commenting on it every time I wore it. (The look on her face was priceless when she realized that it was really hers!) Anyway, I bought fabric to make myself another jacket. I remember that stack of fabric and that sweatshirt sitting on my sewing table BEFORE the "big move" to my new studio. That move took place two years ago! This project has been included in SEVERAL sessions of the (Ravelry) UFO Club. I am SO happy to have it done! Once the binding was applied, I worked on it on and off for about a week and completed it this afternoon on the way back from Mother's Day lunch with my MIL. Hooray! A new jacket that will be PERFECT... for NEXT winter! 2nd Chance Mug Rug Swap, a photo by basketcasejoy on Flickr. This is the little quilt that I made for Oceansong in the 2nd Chance (Ravelry) Mug Rug Swap. Her preferences stated that she likes "shades of green, brown, black, magenta, and so many more." I chose colors hoping that I would get it right. I'm STILL not sure that I got the colors right, but she likes her mug rug. She even commented on in another group. Wondering who the lucky recipient would be... She said that she had a huge, happy smile on her face when she found out that it was HER! Hooray! Nothing better than making someone's day. (Now MY face has a huge, happy smile, too!) And another smile and a big Thank You to Sew Fantastic's simple Mug Rug Tutorial http://sew-fantastic.blogspot.com/2011/03/mug-rug-tutorial-scrappy-colorblock.html, I based my design on your technique. As I said in my last post, the mug rug went out in the mail last week. It arrived at Tortolachick's house today. Fortunately, she is VERY happy with how it turned out. Unfortunately, she thinks it's so pretty that she's afraid to USE it! I told her not to be afraid... it can go through the wash.
Several months ago, two of my friends on Ravelry and I discussed the possibility of having a mug rug swap. We never got around to it. Time went by and mug rugs gained in popularity so another friend decided to host a swap. This time I was ready to participate. After all, how much time would it actually take to make a tiny quilt? Mug Rug??? What's a mug rug? It's an over-sized quilted coaster big enough to hold a cup or glass of your favorite beverage and a snack. The actual size (and shape varies.) The majority are about 7" x 8", but some are as big as 8" x 10". I'll add a photo when the mug rug has arrived at its new home. Life's a Beach, a photo by basketcasejoy on Flickr. Dig in your stash. You never know where it will take you! This week... my stash took me back to the beach. Memories of friends, family, and fun went into the making of this quilt. Well, that and a few bright fabrics from the "kid print" drawer in my studio. Along with memories of beach vacations, this quilt took me on another trip down memory lane. This one is a quilting memory because the central fabric was a past "Quilts for Kids" challenge fabric. It's too bad that I can't bring up a mental image of the actual quilt that I made, but the scraps are proof that I made one! Snippets of a Challenge, a photo by basketcasejoy on Flickr. Hi there! I thought I'd take ONE photo to show ALL of the previously unpictured projects for the Spring 2011 UFO Club. For this session, I've narrowed my focus and set some realistic goals. Most of the projects that I've chosen are REALLY close to being done! Between that and the fact that I submitted fewer selections, I'm hoping to be able to check off a number of the projects on the list. Sing-ups are going on over at Ravelry.com through April 7, 2011. We've got a big crowd for this session. 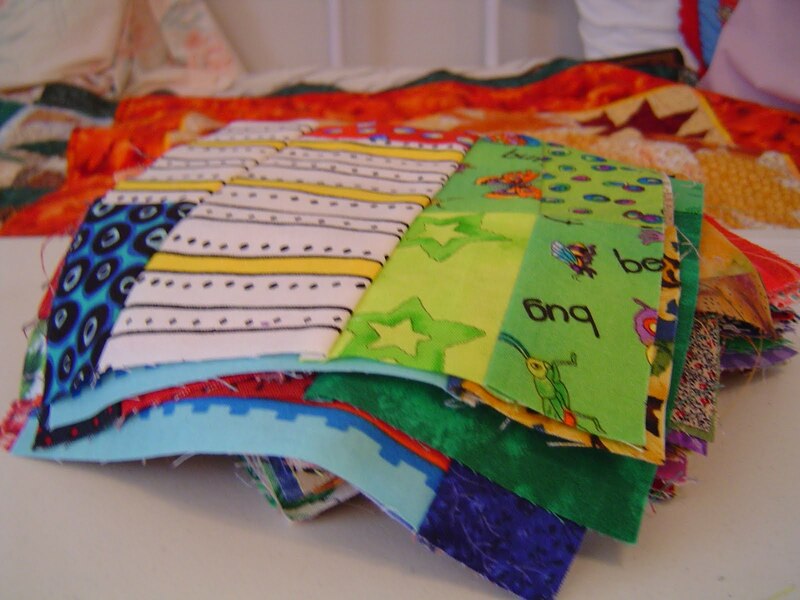 Hopefully, we will all be inspired to finish LOTS of quilts! It might look rather familiar. These are ALL leftover from previous challenges, but I’m hoping they’ve hibernated long enough. I've got one other short-term UFO that I'd really like to see completed. It's been sitting for a month, so I hope you'll agree that it qualifies for the challenge. For those of you following the progress of my UFO Club, there were 11 members participating in this session. Congrats! to the members who completed one or more quilts and thank you to ALL members for playing along. 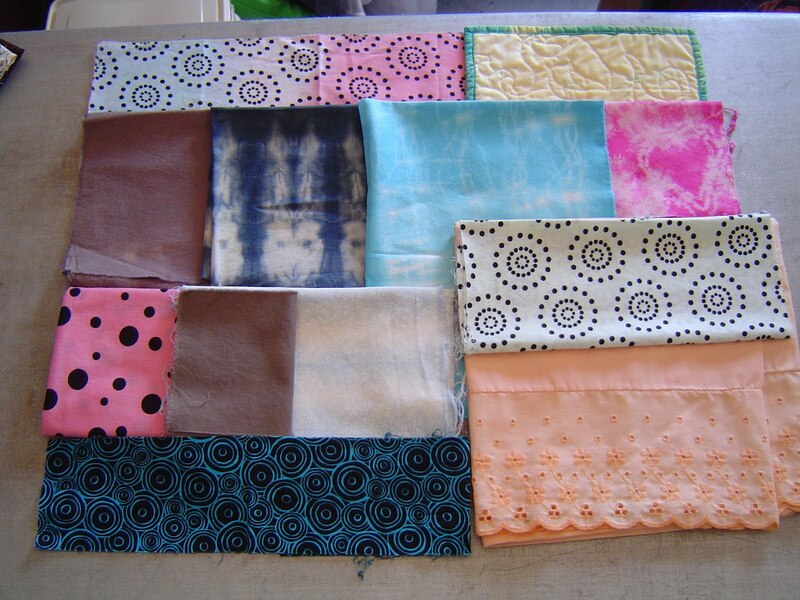 Session Results: 9 quilters completed 16 quilts. Come back next session for more UFO Fun! "Inspired by...", The Set (Quilted) a photo by basketcasejoy on Flickr. I made a point to spend more time in my studio this week. The three small quilts shown in the photo are the result of my efforts. They may even be FINISHED by the next time that I post! I made the most of a weekend at home. My friends were off to the Mid-Atlantic Quilt Festival (the Hampton Roads Show), but I decided to stay home this time and work in my studio. My Circle Challenge for the Art Bee was due last week, but I hadn't even started it.. I hate to admit it, but I’ve known about it since December! I began by making one the size of my drawing (done on a napkin!) and stepped it up a little bigger (and then a little bigger than that.) My pieces measure 2" x 3", 3.5" x 5.5", and 8.5” x 11". Basically, that's a business card, an index card, and a piece of notebook/computer paper! They were done with fusible applique, but I’m not sure where I want to go from here. Any suggestions? First Completed UFO of 2011!!! Question: What should I do??? After adding fusible webbing to the back of my fabric selections, I cut curved strips, and wove them together to create a background. Well, that was fun...but, what now? Next came the curvy red border treatment. (Also applied with fusible.) However, that left the center of the piece blank. NOT good! In keeping with the artsy feel of the piece, I simply added a couple of off-kilter red X's. What do YOU think? Done, but not completed. The question that remained was... how should I quilt it? It was a question that went unanswered for MONTHS. And that answer came just three days ago when my quilt buddy came over to sew with me and her answer was... Don't! The only "quilting" ended up being the stitching lines used to hold down the red bits. Those lines go through all three layers and are, therefore, quilting. (And it's just enough!) Unfortunately, I needed the quilt to be totally finished by Monday night because my Art Bee WAS the program for the quilt guild! There was no time to add a traditional binding AND have time to sew it down by the next night (Plus, I couldn't decide what color binding I wanted to use.) What's a quilter to do?! SERGE!!! So, a non-traditional finishing technique was used for a change of pace on this little 9" x 12" quilt. TIP: Don't forget to put a dab of anti-fray product on the corners so that your "binding" won't come un-sewn! Another completed project should be right around the corner. I'll be sure to post when I'm done with it. What IS a zentangle? At its most basic, a zentangle is a doodle! Some of the zentangles are EXTREMELY complex. While, perhaps not the MOST basic designs, I did choose a relatively simple design that I thought would translate well into the quilt that I was planning. Tonight I was feeling brave (and no one was here to distract me.) So...you may notice that things look a little brighter around here. What do you think? Feel free to comment on the new look and the gadgets that have been added...or let me know if you have suggestions for improvement. My coffee shop friend Erin over at www.CreativeCountryLiving.blogspot.com was writing a post and I commented on how nice her blog looked. (It sounded more like, "How did you GET all those things to show up over along the side of the page?) She was kind enough to share some tips about Blogger. Thanks, Erin! Question: Should this, my newest UFO, become a quilt before all the others waiting in line??? Piecing is SO much more fun than the actual quilting part! Question: Will the intended recipient get this in time for his 1st birthday??? Answer: Let's HOPE so because it was supposed to be his baby quilt! I've started working on the back for this quilt and I've got a Sew Date scheduled for this weekend. This could really happen! Question: Can this basket of blocks REALLY be turned into a quilt in 3 months time??? Answer: If I work really hard, I'm sure that it could! Unfortunately, at this point, only TWO months remain in the Winter session of the UFO Club... and I have yet to touch the project. Question: Where are the OTHER blocks??? Answer: I have NO idea!!! Question: Does it count as DONE if I've completed the label??? The plan is there. The blocks are there. I only have to cut the sashing, do the sewing, baste, quilt, and bind the quilt. I'm almost done! Right?? ?